The towns of Newmarket and Aurora are old settlements that were established over a century ago as development crept north from Toronto along Yonge Street. These centres became the core of post-war development as urban sprawl spread beyond Toronto’s boundaries. Most of this development followed Yonge Street, although the arrival of Highway 404 and two northern GO trains have increased growth. Statistics Canada groups these communities with the three townships of northeastern York Region, including Whitchurch-Stouffville, East Gwillimbury and Georgina Township. Although these communities remain primarily rural, they’ve benefitted from the same transportation connections that have enhanced Aurora and Newmarket, as well as a third GO train extending north from Markham. 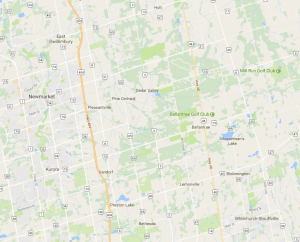 East Gwillimbury, in particular, is dealing with rapid growth, and more is expected in the next twenty years. Although small, the northeastern York Region apartment market is growing. Vacancy rates rose to 2.2% during the 2008 recession, but hover around 2% today. Newmarket, Aurora and the rest of northeast York Region share a number of the categories of its more developed neighbours of Vaughan and Markham. Its distance from Toronto, however, are a drag on demand that has kept vacancy rates above 2%. With the provincial government limiting development along the Oak Ridges Moraine, the growth that has played out in Vaughan and Markham has leapfrogged to these communities. People are searching for affordable land with good transportation connections to Toronto, and for places close to the waterborne amenities of Lake Simcoe. York Region and the province of Ontario plan to enhance these connections, improving bus rapid transit on Yonge Street, adding all day train service between Toronto and Barrie and extending Highway 404 into Georgina Township. The low vacancy rates and strong average rents show that demand is strong for apartments in northeast York Region. Growth in the past five years has not saturated this market, and more growth is expected in the years to come. Limited supply and large demand will continue to make buying opportunities hard to find. Poorer transit access, compared to southern neighbours, will restrain demand, but only slightly. Good opportunities to build here.